During the three days which followed, our progress was exasperatingly slow. I doubt if we made ten miles in the entire three days. The country was hideously savage, so that we were forced to spend hours at a time in hiding from one or another of the great beasts which menaced us continually. There were fewer reptiles; but the quantity of carnivora seemed to have increased, and the reptiles that we did see were perfectly gigantic. I shall never forget one enormous specimen which we came upon browsing upon water-reeds at the edge of the great sea. Most of the biota of Caspak are terrible creatures indeed, locked as they are in what seems like a constant battle for survival: they menace the crew of U-33, they pursue the hominids of the island, they feast upon each other and fight to the death. 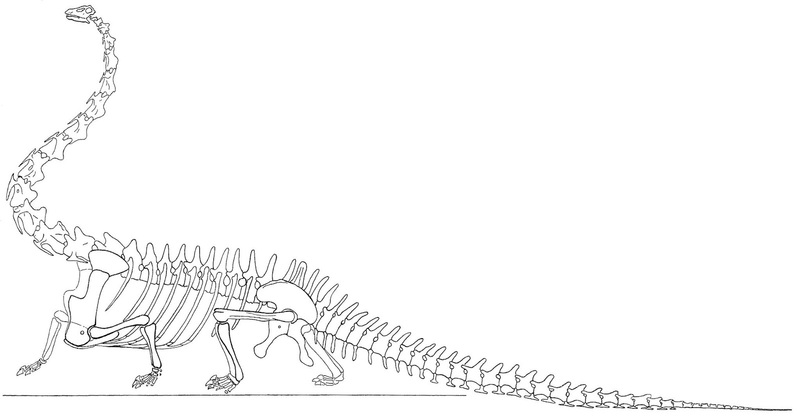 Diplodocus ajori ("Ajor's Double-Beam") is different: even among the beasts of Caprona, this animal is unique. I have had my imagination deeply thrilled lately by reading about the discovery in America of the bones of a fossil animal called the Diplodocus. I hardly know what the word is derived from, but it might possibly mean an animal which takes twice as much, of nourishment, perhaps, or room; either twice as much as is good for it, or twice as much as any other animal. In either case it seems a felicitous description. The creature was a reptile, a gigantic toad or lizard that lived, it is calculated, about three million years ago. It was in Canada that this particular creature lived. The earth was then a far hotter place than now; a terrible steaming swamp, full of rank and luxuriant vegetation, gigantic palms, ferns as big as trees. The diplodocus was upwards of a hundred feet long, a vast inert creature, with a tough black hide. In spite of its enormous bulk its brain was only the size of a pigeon's egg, so that its mental processes must have been of the simplest. It had a big mouth full of rudimentary teeth, of no use to masticate its food, but just sufficing to crop the luxuriant juicy vegetable stalks on which it lived, and of which it ate in the course of the day as much as a small hayrick would contain. The poisonous swamps in which it crept can seldom have seen the light of day; perpetual and appalling torrents of rain must have raged there, steaming and dripping through the dim and monstrous forests, with their fallen day, varied by long periods of fiery tropical sunshine. In this hot gloom the diplodocus trailed itself about, eating, eating; living a century or so; loving, as far as a brain the size of a pigeon's egg can love, and no doubt with a maternal tenderness for its loathly offspring. It had but few foes, though, in the course of endless generations, there sprang up a carnivorous race of creatures which seem to have found the diplodocus tender eating. The particular diplodocus of which I speak probably died of old age in the act of drinking, and was engulfed in a pool of the great curdling, reedy river that ran lazily through the forest. The imagination sickens before the thought of the speedy putrefaction of such a beast under such conditions; but this process over, the creature's bones lay deep in the pool. Another feature of the earth at that date must have been the vast volcanic agencies at work; whole continents were at intervals submerged or uplifted. In this case the whole of the forest country, where the diplodocus lay, was submerged beneath the sea, and sank to a depth of several leagues; for, in the course of countless ages, sea-ooze, to a depth of at least three miles, was deposited over the forest, preserving the trunks and even the very sprays of the tropical vegetation. Who would suppose that the secret history of this great beast would ever be revealed, as it lay century after century beneath the sea-floor? But another convulsion took place, and a huge ridge of country, forming the rocky backbone of North and South America, was thrust up again by a volcanic convulsion, so that the diplodocus now lay a mile above the sea, with a vast pile of downs over his head which became a huge range of snow mountains. Then the rain and the sun began their work; and the whole of the immense bed of uplifted ocean-silt, now become chalk, was carried eastward by mighty rivers, forming the whole continent of North America, between these mountains and the eastern sea. At last the tropic forest was revealed again, a wide tract of petrified tree-trunks and fossil wood. And then out of an excavation, made where one of the last patches of the chalk still lay in a rift of the hills, where the old river-pool had been into which the great beast had sunk, was dug the neck-bone of the creature. Curiosity was aroused by the sight of this fragment of an unknown animal, and bit by bit the great bones came to light; some portions were missing, but further search revealed the remains of three other specimens of the great lizard, and a complete skeleton was put together. The mind positively reels before the story that is here revealed; we, who are feebly accustomed to regard the course of recorded history as the crucial and critical period of the life of the world, must be sobered by the reflection that the whole of the known history of the human race is not the thousandth, not the ten-thousandth part of the history of the planet. What does this vast and incredible panorama mean to us? What is it all about? This ghastly force at work, dealing with life and death on so incredible a scale, and yet guarding its secret so close? The diplodocus, I imagine, seldom indulged in reveries as to how it came to be there; it awoke to life; its business was to crawl about in the hot gloom, to eat, and drink, and sleep, to propagate its kind; and not the least amazing part of the history is that at length should have arisen a race of creatures, human beings, that should be able to reconstruct, however faintly, by investigation, imagination, and deduction, a picture of the dead life of the world. It is this capacity for arriving at what has been, for tracing out the huge mystery of the work of God, that appears to me the most wonderful thing of all. And yet we seem no nearer to the solution of the secret; we come into the world with this incredible gift of placing ourselves, so to speak, on the side of the Creator, of surveying his work; and yet we cannot guess what is in his heart; the stern and majestic eyes of Nature behold us stonily, permitting us to make question, to explore, to investigate, but withholding the secret. And in the light of those inscrutable eyes, how weak and arrogant appear our dogmatic systems of religion, that would profess to define and read the very purposes of God; our dearest conceptions of morality, our pathetic principles, pale and fade before these gigantic indications of mysterious, indifferent energy. Yet even here, I think, the golden thread gleams out in the darkness; for slight and frail as our so-called knowledge, our beliefs, appear, before that awful, accumulated testimony of the past, yet the latest development is none the less the instant guiding of God; it is all as much a gift from him as the blind impulses of the great lizard in the dark forest; and again there emerges the mighty thought, the only thought that can give us the peace we seek, that we are all in his hand, that nothing is forgotten, nothing is small or great in his sight; and that each of our frail, trembling spirits has its place in the prodigious scheme, as much as the vast and fiery globe of the sun on the one hand, and, on the other, the smallest atom of dust that welters deep beneath the sea. All that is, exists; indestructible, august, divine, capable of endless rearrangement, infinite modifications, but undeniably there. This truth, however dimly apprehended, however fitfully followed, ought to give us a certain confidence, a certain patience. In careless moods we may neglect it; in days of grief and pain we may feel that it cannot help us; but it is the truth; and the more we can make it our own, the deeper that we can set it in our trivial spirits, the better are we prepared to learn the lesson which the deepest instinct of our nature bids us believe, that the Father is trying to teach us, or is at least willing that we should learn if we can. The first skeleton of Diplodocus to be scientifically described was found by fossil hunters Benjamin Franklin Mudge and his protégé Samuel Wendell Williston. In 1874, Mudge & Williston embarked upon an expedition on behalf of Bone War General Othniel Charles Marsh through Kansas and Colorado. This was a time when there were few towns in the west of the then-territory (it wouldn't be a state until a few years later), no railroads, and periodic native American "trouble": palaeontology was an adventurous business. Nonetheless, the team found the first Diplodocus (YPM 1920) right outside the young Cañon City, Colorado, in 1877. 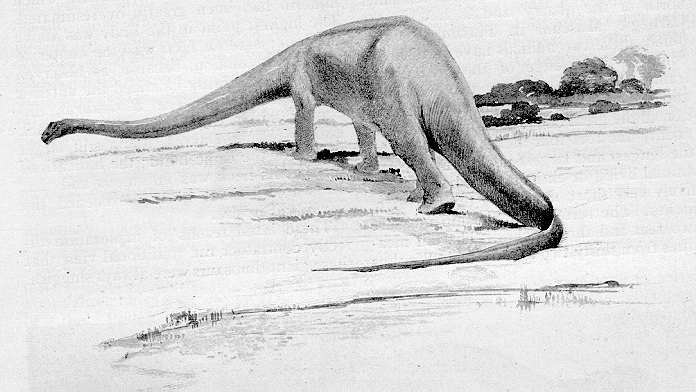 Marsh described and named this species as Diplodocus longus ("long double-beam"), the type species for the genus, in 1878. A second species, Diplodocus lacustris (YPM 1922), was later determined to belong to Camarasaurus. This discovery was one of the first actions in the Bone Wars. Mudge & Williston worked for both Marsh and his nemesis Edward Drinker Cope. Much like Allosaurus, there is a certain amount of controversy around the naming of Diplodocus - in that a creature described by one may be synonymous with an earlier discovery by another. In this case, an argument has been made that Cope's Amphicoelias altus ("high & hollow on both sides") may be one and the same with Diplodocus. However, following the convention established with Tyrannosaurus (more on that in a future post), the historical and cultural importance of Diplodocus would make it a nomen protectum should this become the prevailing consensus. MOST COLOSSAL ANIMAL EVER ON EARTH JUST FOUND OUT WEST. When It Walked the Earth Trembled Under Its Weight of 120,000 Pounds. When It Ate It Filled a Stomach Large Enough to Hold Three Elephants. When It Was Angry Its Terrible Roar Could Be Heard Ten Miles. When It Stood Up Its Height Was Equal to Eleven Stories of a Sky-Scraper. THE largest creature that has ever been known to walk the earth has been discovered in Wyoming. It is a Brontosaurus, a reptile belonging to the extinct order of Dinosaurs, which occupied the earth ages before man appeared. This Brontosaurus was 130 feet in length and weighed probably 120,000 pounds. Its discoverer is Professor W. H. Reeder, of the Wyoming State University. 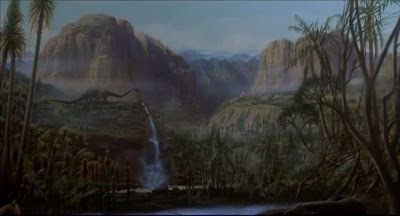 That State is the greatest burial ground of Dinosaurs in the world. When the Brontosaurus walked, the earth trembled. One man cannot lift its smallest bone. Its petrified skeleton weighs 40,000 pounds. Forty persons could be seated with comfort within its ribs. Standing on its hind legs it would have measured a hundred feet in length and could have looked into the eleventh story window of the New York Life Insurance building. Although Diplodocus was well known for many years, a series of events thrust it into celebrity status over the turn of the 20th Century - due in no small part to the legendary industrialist-philanthropist Andrew Carnegie. Carnegie was fascinated by dinosaurs, and so was a significant donor and financier of many palaeontological expeditions, particularly through the Carnegie Museum of Pittsburgh, but it was the great sauropods in particular that captivated him: something about that enormous but gentle giant seemed to appeal to his sensibilities. 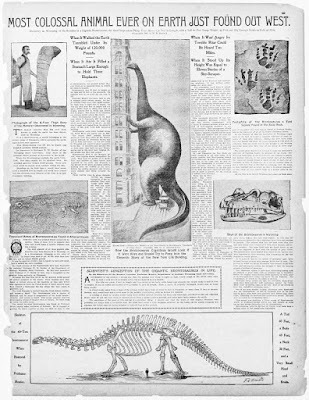 Arthur Coggeshall, preparator-in-chief of the Carnegie Museum's Vertebrate Paleontology Department, made an astounding discovery on the 4th of July, 1899, on a dig at Sheep Creek, Wyoming - an almost complete skeleton of what was surely Diplodocus. 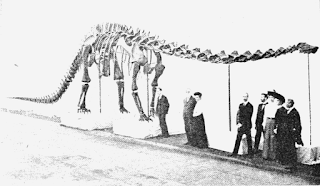 The completeness of the remains, followed by a similar companion skeleton shortly later, convinced Hatcher that this was a Diplodocus - a new species of Diplodocus, in fact. In 1901, Hatcher named the species Diplodocus carnegii, in honour of the museum's patron. This skeleton was initially given the collection number CM 84: after it was mounted at the Carnegie Museum, it eventually became affectionately known as "Dippy." The museum director, William Jacob Holland, was so proud of the discovery he made a sketch of the skeleton and mailed it all the way to Castle Skibo - Carnegie's home in Scotland. Carnegie was evidently just as impressed, as he hanged the picture on the wall: he finally got his Diplodocus. When visiting, Edward VII inquired about the curious skeleton. The British Museum of Natural History simply must have one of those, he surely thought. 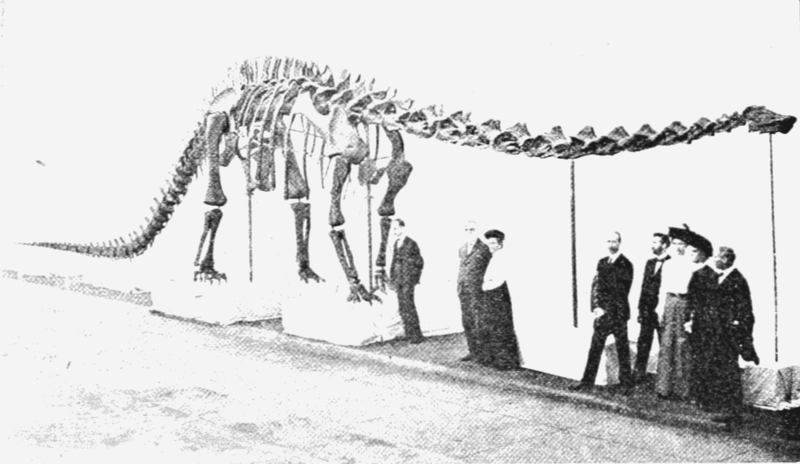 Carnegie asked for Holland to find another skeleton, but seeing as complete skeletons for dinosaurs are rare enough as it is, Carnegie had another idea - a replica. This idea in itself would prove revolutionary: usually museums mounted the fossils themselves, often damaging them in the process, and restricting the amount of research that can be carried out. Mounting plaster casts meant that the real fossils could be preserved and studied, while providing the public with a potent and powerful interaction with the creatures themselves. Thus, in 1905, the first skeletal cast of a Diplodocus was presented to the BMNH, where remained for the rest of the century. 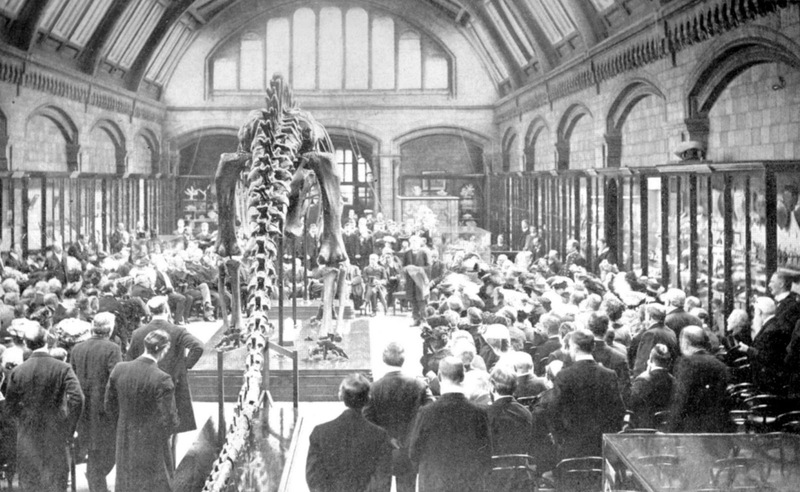 Dippy was such a resounding success that Carnegie ordered more replicas to be produced and transported to museums across the world: to the Museum für Naturkunde in Berlin; the Muséum national d'histoire naturelle in Paris; the Naturhistorisches Museum in Vienna; the Museo Geologico Giovanni Capellini in Bologna; the Zoological Museum of the Zoological Institute of the Russian Academy of Sciences in St. Petersburg; the Museo de la Plata in Argentina; the Museo Nacional de Ciencias Naturales in Madrid; the Museo de Paleontología in Mexico City; and finally the Paläontologische Museum München in Munich. Dippy was the first global dinosaur skeleton. 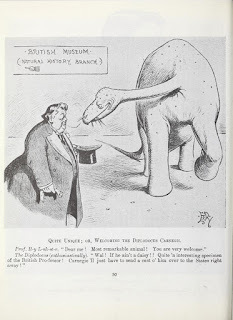 Dippy has not been free of controversy: Ray Lankaster, the BMNH's director at the time, mildly lamented the imposition of an American dinosaur when there were plenty of perfectly good British dinosaurs for people to see - a notion reflected in many cartoons of the time (and, indeed, today) - and made great pains to point out that Diplodocus was, after all, simply "an improved and enlarged form of an English creature, for we have recently discovered in the Oxford clays a specimen of a dinosaur not quite as large as Diplodocus, but in a measure a rival... You will find the remains of this creature in the Hall of Palaeontology." Likewise, John Lubbock was bizarrely condescending in his acceptance, commenting that "the size of the animal does not indeed necessarily add much to the interest." The notion that Dippy is not a "real" fossil skeleton is also something very intelligent and not at all tedious bores love to point out, ignoring the historical, sociological, & cultural value the cast itself retains. Unlike tiresome one-upmanship between imperial powers, Dippy has withstood the tests of critics and time, and is currently on a tour of museums around the isles. Since then, Diplodocus skeletons have been found all over Laurentia - what is now the United States - in the Morrison Formation, around the general vicinity of the Rocky Mountains. Some remains, such as those found in Wyoming by William H. Utterback in 1902, are now considered a new genus, while some like Seismosaurus halli ("Hall's earthquake lizard") are now considered species of Diplodocus. In a paper published some months ago (Amer. Naturalist, vol. xliii, 1908, pp. 672–681) the writer advanced the proposition that the sauropodous dinosaurs, especially Diplodocus, did not walk, as the elephants do, with the body high up from the ground and with the legs straight or nearly so, and moving in approximately perpendicular planes, but rather as do the crocodiles, with the body low down, and with the thighs standing well out from the animals sides. While I was further considering the subject I received from my friend Dr. O. Abel, of Vienna, a paper1 in which, while endorsing my views regarding the nature of the food of Diplodocus and the manner of taking it, he endeavors to show that I am in error as to the bodily pose and the manner of locomotion of the sauropods. Dr. Abel maintains that the accepted views of the way in which these animals walked is the correct one and he finds support for this view in the structure of the feet. He accepts Hatcher's opinion that Diplodocus and Brontosaurus were digitigrade and argues that therefore they walked as represented in Hatcher's restoration of the reptile. The evidences that they were digitigrade are found in the belief, probably correct, that the upper ends of the metatarsals and metacarpals were not arranged in a straight line, but in an arc of a circle; further, that the feet were entaxonic, that is, had the inner digits more strongly developed than the outer ones. Now, it is the writer's opinion that these evidences of digitigrady will hardly stand a test. The hinder feet of the bear are certainly plantigrade and yet the metatarsals are arranged very distinctly in an arc of a circle. On the other hand, the tiger and the hyæna are digitigrade, but their metatarsals are almost in a plane. Various animals will, I think, be found to transgress Dr. Abel's rule, as one may see by looking through a collection of skeletons. Furthermore, if it is desired to see an entaxonic foot in which the metatarsals are arranged in an arc of a circle and which is nevertheless plantigrade one has only to examine the foot of the human skeleton. The writer is not disposed to deny that Diplodocus and its relatives were more or less digitigrade; but this digitigrady, through perhaps equal to that of the hinder foot of the elephant, does not prove that these reptiles walked like the elephant. 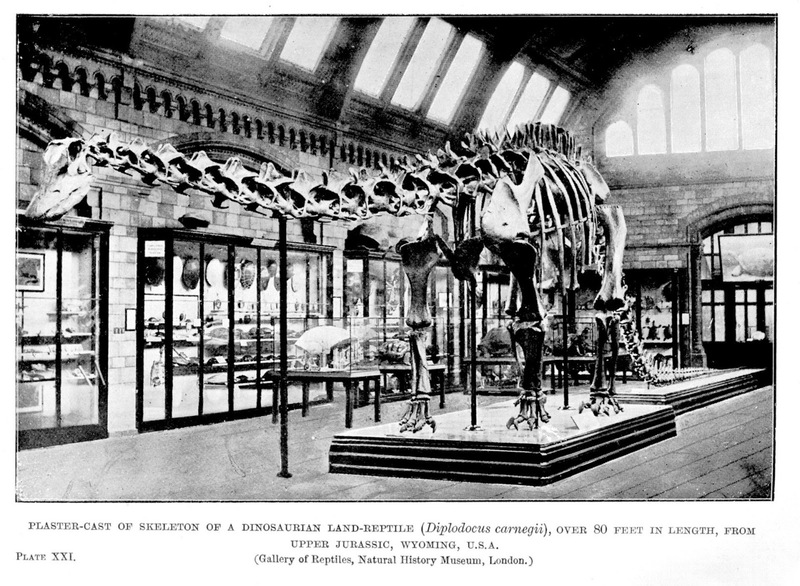 Diplodocus' celebrity made it a natural figure for inclusion in literature of the late 19th and early 20th Centuries. I never thought this fighting an antediluvian monster would be such a complicated job. This one is a woman, with all a woman's wit, combined with the heartlessness of a Cocotte. She has the strength and impregnability of a diplodocus. Diplodocus' earliest literary appearances were in books that you wouldn't immediately associate with dinosaurs - collections of humourous vignettes like Stephen Leacock's Arcadian Adventures with the Idle Rich (1914), whimsical yarns like Mabell S.C. Smith's Ethel Morton's Enterprises (1915), to war memoirs like Frederick Palmer's My Second Year of the War (1917) and R. Derby Holmes' A Yankee in the Trenches (1918). Diplodocus was gaining traction as a new metaphor for something huge and impressive. This expanded to books beyond the Anglosphere, such as Paul Bourget's La dame qui a perdu son peintre (1910), Joseph Henri Honoré's La Mort de la Terre (1912), and Pío Baroja's Youth And Egolatry (1917). Nonetheless, Diplodocus itself started to appear in dinofiction fairly quickly. One of the most interesting early appearances for Diplodocus is in Porter Emerson Browne's tall tale "The Diplodocus" (1908), first published in New Broadway Magazine. This curious short story features an ambitious old man attempting to recreate the titular dinosaur through mixing genetic material from modern animals - Jurassic Park as written by Robert Service, and it's absolutely hilarious. A year later, John Kendrick Bangs devotes a chapter explaining the extinction of the Mastodon, the Diplodocus, and several other creatures as a result of Noah's incompetence in The Autobiography of Methuselah (1909). Just before The Lost World debuted, Harry Allen's "The Chase of the Diplodocus" (1912) was published in The Red Book Magazine v18n3, January 1912. Before the village were assembled a great concourse of warriors. Inside I could see the heads of women and children peering over the top of the wall; and also, farther back, the long necks of lidi, topped by their tiny heads. Lidi, by the way, is both the singular and plural form of the noun that describes the huge beasts of burden of the Thurians. They are enormous quadrupeds, eighty or a hundred feet long, with very small heads perched at the top of very long, slender necks. Their heads are quite forty feet from the ground. Their gait is slow and deliberate, but so enormous are their strides that, as a matter of fact, they cover the ground quite rapidly. Perry has told me that they are almost identical with the fossilized remains of the diplodocus of the outer crust's Jurassic age. I have to take his word for it—and I guess you will, unless you know more of such matters than I.
J. Allen St. John's depiction of the lidi is, like most of his prehistoric beasties, highly fanciful and very different from even contemporaneous palaeoart in terms of morphology: the head and limbs of his lidi in particular are much closer to a sauropodomorph like Plateosaurus than Diplodocus itself. However, the actions of his dinosaurs - in this case, the tripodal stance - do have a basis in palaeoart. 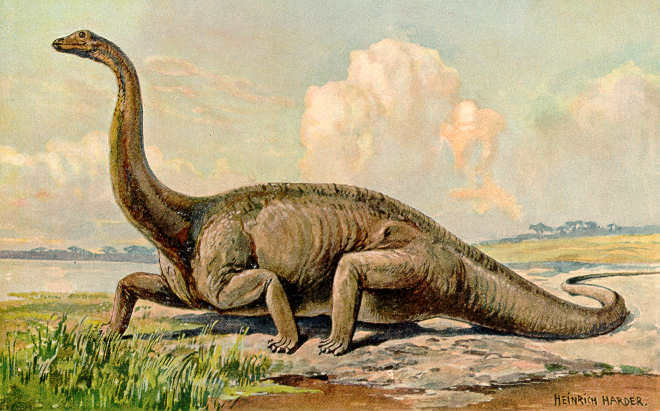 None other than Charles R. Knight painted a Diplodocus, the more agile and gracile relative of Brontosaurus, in this manner. While most palaeontologists agree that Diplodocus was mainly quadrupedal, the idea that it could rear up on its hind legs is well-supported today - indeed , from a biomechanical standpoint, Diplodocus was better suited to rearing than most mammals. 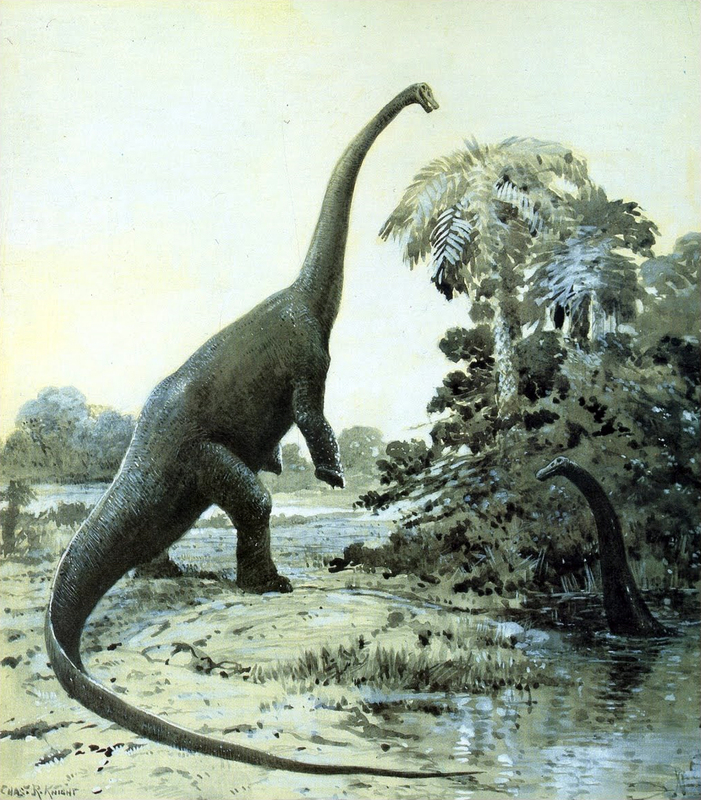 Knight's depiction of Diplodocus graced the cover of Scientific American in the June 1907 issue. It stood well over twelve feet high at the rump, its highest point, and with its enormously long tail and neck it was somewhere between seventy-five and a hundred feet in length. Its head was ridiculously small; its body was unarmored, but its great bulk gave it a most formidable appearance. My experience of Caspakian life led me to believe that the gigantic creature would but have to see us to attack us, and so I raised my rifle and at the same time drew away toward some brush which offered concealment; but Ajor only laughed, and picking up a stick, ran toward the great thing, shouting. All Diplodocus remains from the time Burroughs wrote The Land That Time Forgot were indeed extrapolated to creatures somewhere in the 75-100 foot range: Diplodocus carnegii is generally felt to be on the smaller end of that ruler, with the nearly complete CM84/Dippy stretching to 70ft/21.3m, whereas Diplodocus longus is estimated to be in the region of 92ft/28m. Diplodocus hallorum wasn't discovered until decades after Burrough's death, but over time its length has ranged from the original gargantuan Seismosaurus estimates (39m/129ft-52m/170ft) to the smaller but still gigantic modern extrapolations (33m/108ft). As for height, 12ft actually seems like a conservative estimate: Dippy is a good 4.25m/13.9ft at the hip, with larger Diplodocus estimated to exceed 5m/16ft - though if we go for the Tornier-Haye model of a sprawling Diplodocus, that would naturally bring D. ajori's height closer to earth. The little head was raised high upon the long neck as the animal stupidly looked here and there in search of the author of the disturbance. At last its eyes discovered tiny little Ajor, and then she hurled the stick at the diminutive head. With a cry that sounded not unlike the bleat of a sheep, the colossal creature shuffled into the water and was soon submerged. The perceived lack of intelligence of sauropods like Diplodocus is a common thread, and linked to one of the more bizarre theories of dinosaur anatomy - that their nervous systems are so inefficient, it would take them a ludicrous amount of time to respond to grievous injuries. I think of the Home Office as a mighty dinosaur which moves in its own way, and that the Minister represents the tiny brain at the front of the animal but probably does not know what goes on in its bowels or at the back of its tail. "The company is like a dinosaur," he replied in answer to our query, "because when a dinosaur dies, three days later its tail twitches. It takes that long to get the message from the brain to the tail that it's dead." 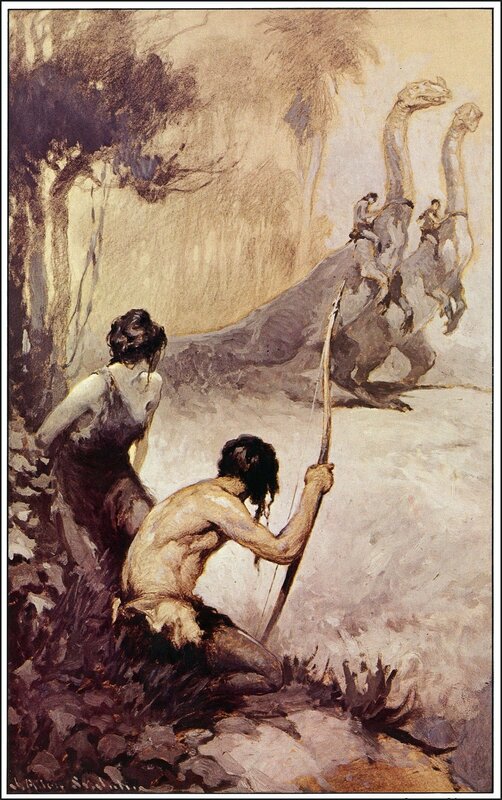 It is really astonishing the length of time it takes for perceptions of even mortal injuries to reach the brains of some of the lower orders of Pellucidar. I have seen a lidi painfully wounded in the tail totally unconscious of its hurt for almost a full minute; but then it is sometimes a matter of sixty feet from the tip of a lidi's tail to its minute brain at the far extremity of its huge body. An even more bizarre theory is shared with its plated pal, the Stegosaurus - the Double Brain Hypothesis. Marsh himself supposed that a mysterious chamber in Stegosaurus' tail could have been the repository for a secondary brain to control the rear legs and tail. This, being really weird, took the public imagination, and was soon expanded to include any dinosaur with a long tail and little brain, like Diplodocus. This meme is so persistent that it turns up in 21st century "documentaries" - despite palaeontology being more or less united in opposition to it. And I thought for a second about the old dinosaurs, the huge ones with long necks and long tails, and how they had walnut-sized brains and needed all these other littler brains to relay a message from the tip of the tail to the bigger brain in the head. Hey something is biting you back here. Hey something is biting you back here. Hey something it biting you back here. Until it got the message: Hey something is biting me back there. That's before getting to the films: The People That Time Forgot (1977) and even Pacific Rim (released in 2012) depicted or at least mentioned the idea of dinosaurs needing two brains to function. It's one of those things which sounds reasonable, but simply falls apart under any sort of logical scrutiny. As I slowly recalled my collegiate studies and paleontological readings in Bowen's textbooks, I realized that I had looked upon nothing less than a diplodocus of the Upper Jurassic; but how infinitely different was the true, live thing from the crude restorations of Hatcher and Holland! Here we have Burroughs explicitly invoke Hatcher and Holland, two palaeontologists deeply involved in the history of Diplodocus - and, indeed, specifically that of Diplodocus carnegii, still fresh in the publish consciousness by the time of The Land That Time Forgot's publication. And, indeed, we find a very interesting point by Burroughs - that no matter how much we may think we know about dinosaurs (or any fossil creature) from their remains, there is still a wide gulf that remains unknown. What would Hatcher and Holland have made of the current palaeontological analysis of Diplodocus? We can only guess. I had had the idea that the diplodocus was a land-animal, but evidently it is partially amphibious. I have seen several since my first encounter, and in each case the creature took to the sea for concealment as soon as it was disturbed. It's unclear why Billings had the idea Diplodocus was terrestrial, as most of the palaeontological science of the time were thoroughly convinced of "partial amphibiousness." W.D. Matthew's Dinosaurs (1915) titles an entire chapter "The Amphibious Dinosaurs - Brontosaurus, Diplodocus, etc." 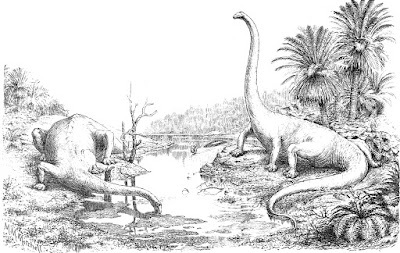 Nonetheless, most illustrations put Diplodocus on dry land, even in the time of the water-dwelling theory - from Knight & Harder to F. John & Alice B. Woodward, and many more. We can also infer that D. ajori, being a Caspakian species, may have adaptations that are completely unlike those of D. carnegii or associated Mesozoic species. Indeed, the spawning aspect of Caspakian fauna suggests that a great deal of lifeforms may be closer to the water than their prehistoric counterparts may suggest. With the exception of its gigantic tail, it has no weapon of defense; but with this appendage it can lash so terrific a blow as to lay low even a giant cave-bear, stunned and broken. It is a stupid, simple, gentle beast - one of the few within Caspak which such a description might even remotely fit. This is a key passage, as it is a reflection of the place Diplodocus takes in popular culture - the gentle giant. For decades, dinosaurs had a reputation as interminable, internecine battlers: The Country of the Iguanodon depicting nominally herbivorous dinosaurs biting lumps out of each other. This constant state of warfare gave the impression of eternal strife and violence in the Age of Dinosaurs. Yet with Diplodocus, the popular idea was different: here was a creature with no great claws or teeth to rend and tear with, but a simply enormous creature that seemed to do little but eat. Its tiny head incongruous with its massive body; its great limbs furnished only with the bones to support its weight; its long whip-like tail viewed as a deterrent rather than true weapon. The perceived docility of Diplodocus marked a very different side to the "terrible lizards." Putting aside the obvious bloodthirstiness of the carnivores, even the plant-eaters seemed formidable combatants: Triceratops had its horns; Stegosaurus its spiked tail; Iguanodon its vicious thumb shanks. Even Brontosaurus had a bombastic name evocative of thunder and shaking of the earth. Diplodocus, one of the largest and most physically impressive of all the Dinosauria, seemed to reject the violence of its kin - a gentle giant. The gentility of Diplodocus takes on greater significance when one considers its greatest promoter. Andrew Carnegie has an illustrious history as an industrialist, capitalist, entrepreneur, and magnate - but towards the end of his life, he became increasingly predisposed to philanthropy and good causes. Following Carnegie's donation of the first casted skeleton, many famous and influential people requested their own Dippy. Carnegie was only too happy to oblige - so long as the requests were made by no less than heads of state. Why? People may wonder; why did Andrew Carnegie donate so many casts and why did he demand requests by heads of state in order to obtain a cast? It was not all vanity and fame. It was also building up useful connections for peace. Andrew Carnegie was, besides a shrewd businessman and philanthropist, also active in the peace movement, paying (among others) for the construction of the Peace Palace. The peace movement had been active for many years and influencing public opinion was much easier than influencing politicians and the national elites. Using his casts as gifts, Andrew Carnegie came into contact with heads of state. Through these personal connections, he promoted peace and the peaceful settlement of disputes through arbitration. Peace Diplomacy by Dinosaur. Carnegie is estimated to have donated 90% of all his wealth in the last few years of his life. His Gospel of Wealth promotes the civic responsibility of wealthy individuals to redistribute their surplus resources for the betterment of humanity - to use their power for good causes. Perhaps this is what makes the Diplodocus such a beloved creature: with its vast size and strength, it could easily dominate smaller creatures - but it does not. All it wishes to do is eat, drink, and live in peace. It presents the wonder and majesty of nature without the red tooth or claw. Argumentum ad feminam, as we said in old Rome and ancient Greece in the consulship of Diplodocus and Ichthyosauros. 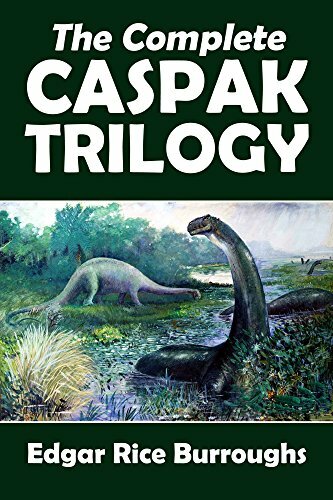 Diplodocus continued to feature in science fiction and fantasy literature. Burroughs himself continued his Pellucidar adventures, Lidi included: they make a return appearance in "Men of the Bronze Age" (1942) are briefly mentioned in Land of Terror (1944). Following Burroughs' smash hit, Diplodocus turned up in too many pulp adventures to count. 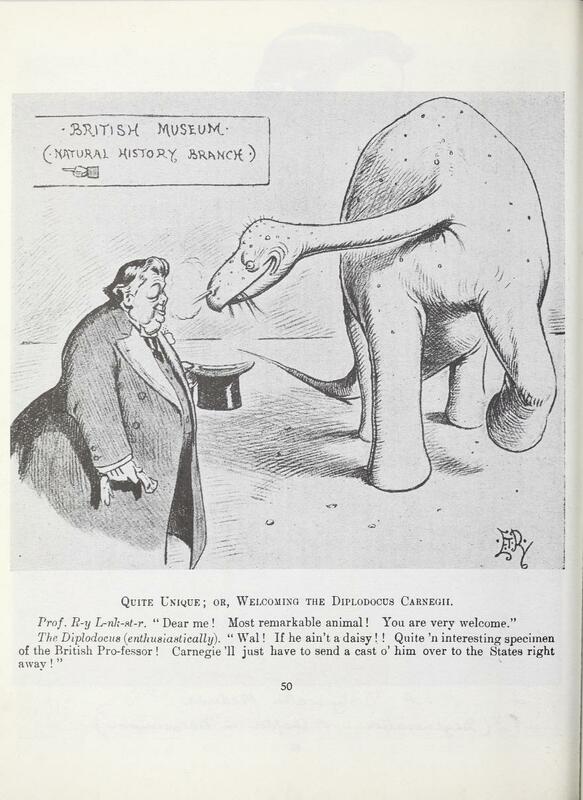 As for cinema, Diplodocus actually made its cinematic debut before "The People That Time Forgot": Bray Studios' Diplodocus (1914), clearly influenced by Winsor McKay's famous Gertie the Dinosaur. Alas, the creature was not seen in the sequel, thus depriving the world of the sight of Dana Gillespie chasing a startled Diplodocus into the water. Diplodocus has always been a star attraction among the Dinosauria for its personality as well as its grand physical presence. It seems natural that D. ajori retains a particularly peaceful place in The Land That Time Forgot.